I made this recipe for a celiac friend. I used gluten-free flours, trying to create a smooth and homogeneous dough. The result is excellent! 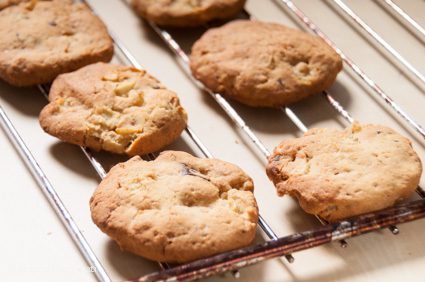 These soft and delicate cookies melt nicely in the mouth, slowly releasing an intense dark chocolate flavour. 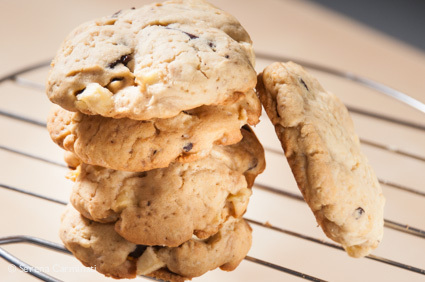 If you prepare this recipe for a gluten-intolerant friend , use only flour, potato starch and corn starch specific for celiac people, and make sure that the absence of gluten is clearly indicated on the packaging. 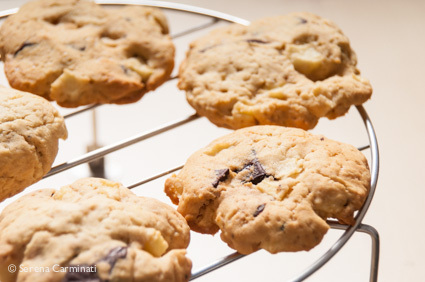 Apple and chocolate chip cookies (gluten-free). 1. In a bowl, sift the flour with the corn and potato starch. 2. 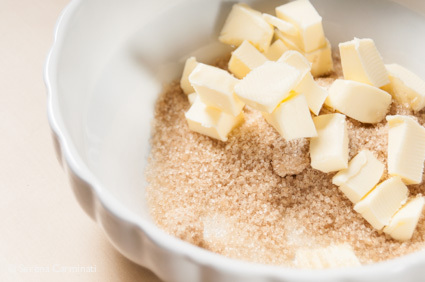 Separately, mix the butter with sugar. 3. 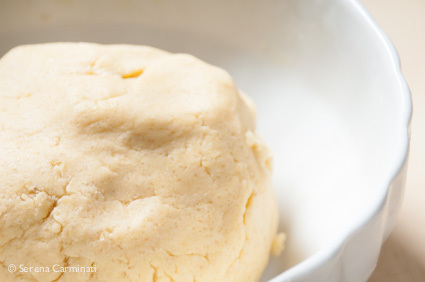 Add an egg with two drops of vanilla essence to the butter. 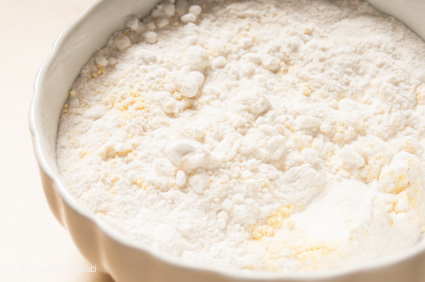 Mix well, then add two tablespoons of yogurt and a teaspoon of baking soda to the mixture. Knead the dough. 4. Peel and cut the apple into very small cubes, break the chocolate into pieces and add them with a pinch of salt to the mixture. 5. 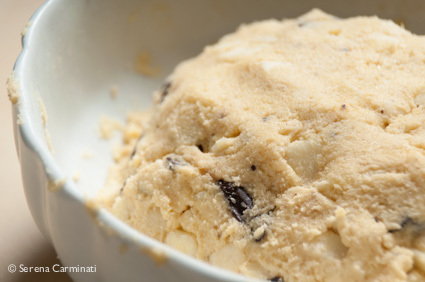 Put the dough to cool in the refrigerator for 30 minutes. 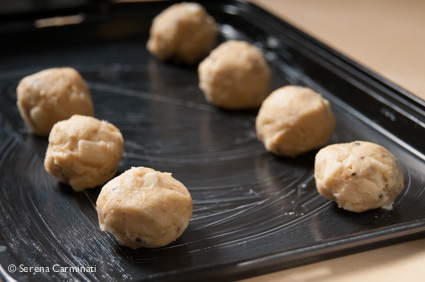 Grease two or three baking sheets (depending on the size), shape the dough into small balls (4.5 cm each) and place them on the baking sheets, quite far apart from one another. 6. Slightly flatten the dough balls to make the cookies. 7. Bake at 170 ° C (338°F) for 15-18 minutes. 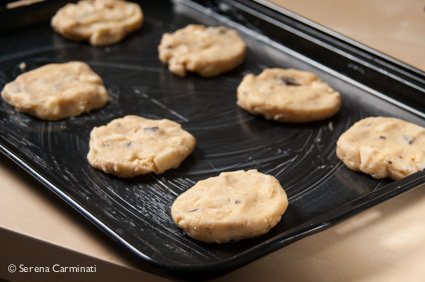 Place the cookies to cool on a rack. Biscotti morbidi con cioccolato e mele (senza glutine). 1. 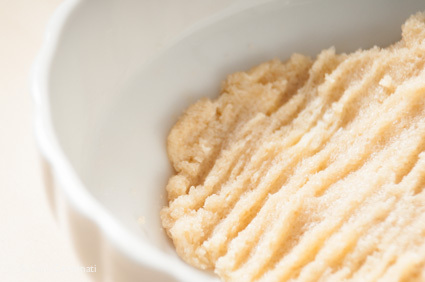 In una terrina, setacciate le farine con l’amido di mais e la fecola di patate. A parte, lavorate il burro con lo zucchero. 2. Aggiungete l’uovo con le gocce di essenza di vaniglia al burro lavorato. 3. Amalgamate bene e unite alla farina, aggiungendo due cucchiai di yogurt e un cucchiaino di bicarbonato. Impastate tutto. 4. 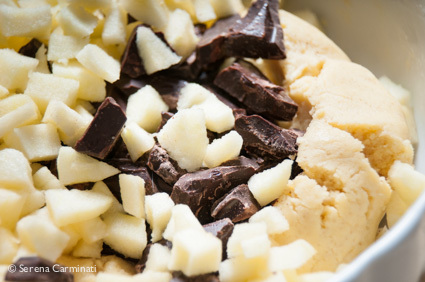 Sbucciate e tagliate la mela a cubetti molto piccoli, rompete il cioccolato in pezzi ed aggiungeteli, con un pizzico di sale, all’impasto. 5. Mettete l’impasto a riposare per 30 minuti nel frigorifero. Imburrate due o tre teglie (dipende dalla grandezza), formate delle palline di circa 4,5 cm e mettetele sulle teglie, abbastanza distanti l’una dall’altra. 6. Schiacciate l’impasto per dare la forma ai biscotti. 7. Infornate a 170 ° per 15-18 minuti, poi lasciate raffreddare i biscotti su una griglia.